Treats Itchy, Flaky Scalp Conditions. For Shiny and Manageable Hair. 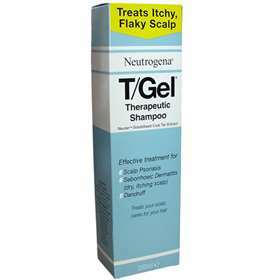 Neutrogena T-Gel Therapeutic Shampoo is an effective treatment against Scalp Psoriasis, Seborroeic Dermatitis and Dandruff, whilst still caring for your hair. T-Gel is a fragranced medicated shampoo and can be used as frequently as recommended by your doctor or dermatologist. T-Gel's active ingredient is Neutar™, a solubilised coal tar extract. Do not use if you are allergic to Coal Tar. If skin becomes irritated discontinue use and consult doctor.